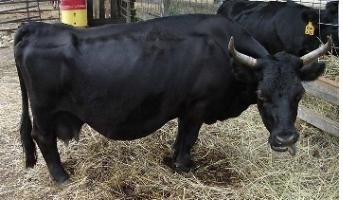 Dwarfism in Cattle: Most forms of dwarfism are inherited and result from mutated genes. These mutations impair cartilage and bone formation in early development and results in various types of dwarfism. Some forms of dwarfism result from environmental factors that influence embryonic development, such as the BVD virus (bovine viral diarrhea), fungal toxins, plant poisons, or a manganese deficiency, during gestation. However, most forms of dwarfism in cattle occur when a calf receives one or two mutated genes from the parents. Types of Dwarfism in cattle vary, according to the specific mutation. In general, dwarfism causes shorter stature, and varying degrees of deformities in the limbs, joints, head and spine. Dwarfism can be categorized as either proportionate (an overall size reduction without changes in body proportions) or disproportionate (a size reduction in one or more limbs, with changes in body proportions). Some types of dwarfism can include cleft palate, abdominal hernia or other abnormalities. Some forms of dwarfism are non-viable (lethal). Chondrodysplasia. Disproportional dwarfism is referred to as chondrodysplasia (in the past it was also referred to as achondroplasia or chondrodystrophy). Congenital disproportionate dwarfism is described in a number of different cattle breeds with varying modes of inheritance. Chondrodysplasia disproportionate dwarfism expresses with shortened limbs in cattle. Bulldog Dwarfism in Dexter cattle is one of the earliest described Mendelian disorders in mammals. It affects the aggrecan (ACAN) gene. Dexter dwarfism has incompletely dominant inheritance, leading to a mild form of dwarfism in heterozygotes (carriers of 1 copy). When inherited in homozygous form (calf inherits 2 copies), the lethal expression occurs, and the result is a dead aborted or stillborn calf that physically resembles a bulldog. This version of chondrodysplasia is known as BD which stands for "bulldog". There are several different mutations of the ACAN gene, as well as other genes, that are associated with the same resulting bulldog-type dwarfism (phenotype). 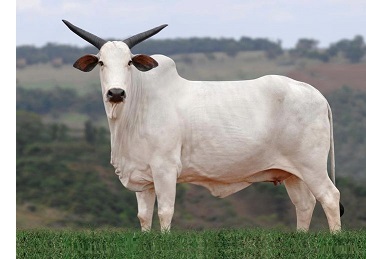 Besides the Dexter, BD mutations have also been found in Nellore cattle of Brazil, and in Holstein of Denmark. Dexter upgrades of New Zealand carry BD2 specifically, along with the original BD1. BD1 has existed in purebred Irish Dexters for centuries. Dwarfism in Miniature Cattle. Most miniature cattle are naturally miniature, with no dwarfism. 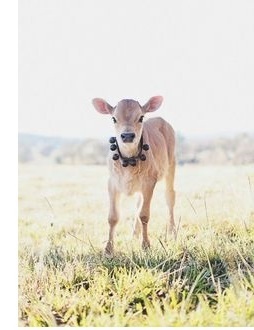 Some miniature cattle are small cattle that carry BD. These carriers have Irish Dexter DNA in their pedigree. The Dexter Cattle Association says a chondro carrier cow is 2-4 inches taller (genetically) and a chondro carrier bull is 4-6 inches taller, genetically. Autosomal means it is an inherited trait not related to gender. It is partially expressed when a single copy is inherited (heterozygous). It is fully expressed when 2 copies are inherited (homozygous). Lethal gene is a gene mutation that is not survivable when inherited in homozygous form. Miniature cattle carriers have 1 copy of a BD mutation. Since BD is a lethal mutation, if a fetus inherits 2 copies of a BD mutation, one from each parent, it is not viable. disproportionate dwarfism. A bulldog calf is the non-viable fetus with tiny legs, a protruding tongue and a flat face that look similar to a bulldog. A dead bulldog fetus is usually aborted in mid to late pregnancy. It usually doesn't cause dystocia (calving difficulty), but if carried full term, the risk increases. 50% of the offspring are expected to be short (dwarf) cattle ("heterozygous" chondrodysplasia). 1 ACAN gene allele has the BD mutation, and the calf is affected by mild dwarfism, most notably in height. In miniature and small cattle, mature height can be reduced from 2 to 6 inches. In standard breeds, dwarfism can reduce mature height up to 8 or 9 inches. 25% of the offspring are expected to be normal cattle (chondro free or non carrier). Since both ACAN alleles inherited are normal, the calf grows to its genetically natural height. Its natural height of course, can genetically be anywhere from short to tall, depending upon its breed and its parents' natural size. There are 2 kinds of BullDog dwarf genes; BD1 and BD2. BD1 and BD2 are two different mutations of the ACAN, unique to the Dexter breed, that do about the same thing. 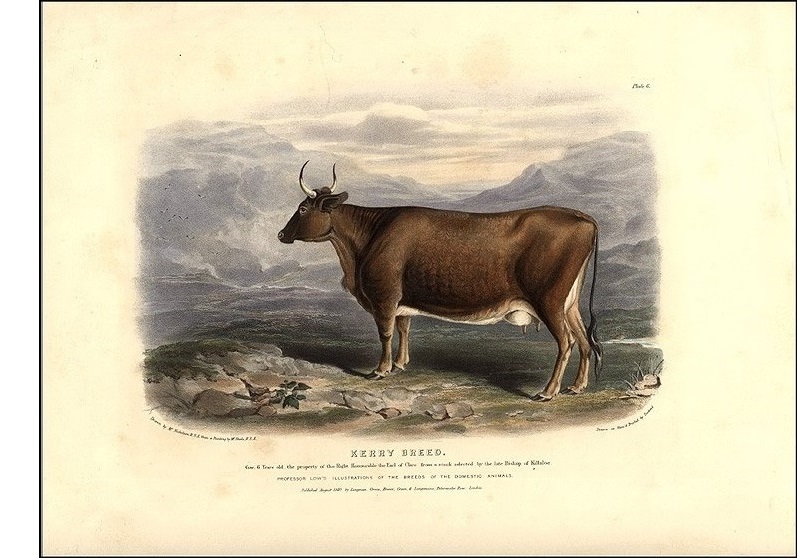 BD2: was discovered in upgraded New Zealand Irish Dexter cattle descended from Meadowpark Charles. Read more about BD2 Dexter NZ mutation here: Chondrodysplasia, by Robyn Snelgar, dextercattle.nz. BD2 is not found in North American miniature cattle. When we talk about BD in North America, we are talking about bulldog dwarfism in general, or the BD1 mutation in particular. Compound Heterozygote: Also Lethal; a fetus that inherits one copy each of BD1 and BD2, will also be a bulldog calf. There are a number of genetic mutations in cattle that will cause dwarfism. primary population genetic dwarfism mutation gene mode of inheritance hetero homoz DNA test? Charolais X Salers disproportionate (bulldog) BD(-) COL2A1 (country?) recessive Dwarf Lethal ? Brazilian Nelore disproportionate (bulldog) BD(/) ? semi-Dominant Dwarf Lethal ? Dolichocephalic or Snorter dwarfism was about eradicated in Herefords & Angus by the 1970s. Brahman (Florida) proportionate; growth hormone GH1 recessive (2009) normal Dwarf ? Low birth weight and postnatal growth restriction are the most evident symptoms of dwarfism. Accompanying skeletal aberrations may compromise the general condition and locomotion of affected individuals. Newborn chondro calves normally present with dished faces and loose hips (soft cartilage), which they outgrow (the cartilage firms up to normal), and shorter legs, especially short cannon bones. Chondro positive miniature cattle can be quite small, and are often bred for pets. People who favor and enjoy very small cattle love their chondro carriers. Sometimes the tiniest, fuzziest, fanciest colored dwarf calves fetch high prices due to their "cuteness factor". 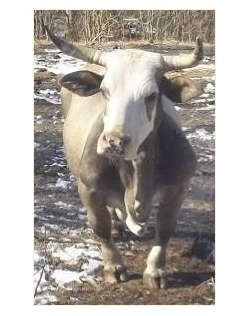 Armageddon, a condro-carrier 40" tall bucking bull. This bull is an example of a chondro carrier that has no sign of dwarfism other than a short stature; “...he was such a sweet boy, he came when called. He got so excited when he saw the trailer you'd have thought he was wild & crazy, but he just absolutely LOVED loved to go rodeo--he loaded himself in the trailer! He was always a gent in the trailer & loading in the chutes. He begged for treats & back scratches; never ever offered to hurt his rider or any of the clowns or chute help. In this video he was age 9; this was the first time he was ever ridden & the little cowboy scored a 92.5! Armageddon divided his time between the pasture with his girls and the bucking arena. His legs were clean & blemish free as was the rest of him. He never had any symptoms whatsoever that he was chondro-positive except for his short legs.” (~former owner) Editorial comment: Armageddon's breeder has bred short cattle for decades, long before we fully understood the genetics. I am told that all his cattle are about the same size from having been selected small for generations, and he pays no attention to BD. His cattle have been selected for soundness and conformation that apparently works quite successfully with carrying chondro. Variation of Effect: It is important to emphasize the wide variation in how much dwarfism affects different carrier cattle, and different herds of cattle. In incomplete dominant traits, inheriting one copy causes a partial effect. In the case of BD1 dwarfism, it ranges anywhere from "almost no effect" to "some effect". That is mostly in height. However many herds selected for useful family milk and meat production may be negatively affected by arthritis as they age. Penetrance and expressivity: These two genetic terms are frequently misunderstood and they certainly cause confusion in diagnosing genetic disorders and their mode of inheritance. Penetrance refers to the proportion of individuals with a given genotype expressing any or all of the phenotypic features of the disorder, i.e. not all animals with a particular genotype show phenotypic manifestations. In contrast, expressivity, or variability in clinical expression, describes the range of phenotypic effects in individuals carrying a given mutation. These two terms may overlap, particularly when used in terms of age of onset of a disorder. The penetrance and expressivity of the BD1 gene found in Irish Dexter and in percentage breeds that started out being miniaturized with Dexter dwarfism DNA, might explain why some BD carriers, and why some BD carrier herds, suffer more than others do. Most Miniature Cattle will probably fare better on small acreages than on large pastures. Little animals will do better when not having to share pasture and physically compete with larger animals over feed or hay. Carrier cattle might not thrive if having to hunt grass and walk all day, which might cause excessive wear & tear on their joints and shorter legs. MANAGEMENT: Proper management of chondro cattle means taking whatever steps are necessary to prevent two carrier animals from breeding. That can include good fences so that chondro bulls can't get to chondro cows, or, making sure young chondro positive bull calves are castrated or separated from the cow herd well before being able to breed. Some carrier cattle breeders run only chondro negative bulls, and band (castrate) all the bull calves shortly after birth, and market them as pets or butcher steers. With that herd plan, no birth defects are possible. And, the cow herd doesn't need BD testing (a considerable cost saving in larger herds). The terms “Shorty” or “Short” or “Short-Legged” may be used to describe genotype or phenotype. These terms were historically used among Dexter breeders in reference to chondro positive cattle (long before the genetics were fully understood). BD(+) cattle are usually recognizable, visibly. They often have broader or larger heads for their stature, and they usually have shortened legs (most noticeable are their short cannon bones from the knee and hock to the fetlock). Since only the skeleton and joint cartilage is affected by the BD gene, essentially, the rest of their bodies is actually still normal sized organs & muscles on a reduced frame. Short legged and long legged may be used to describe phenotype: thick, beefy cattle (regardless of their genetic makeup) that are shorter and wider compared to taller or narrower framed herdmates. Because mini cattle breeders have been selecting for short cattle for centuries, there are plenty of miniature cattle that are not dwarfed. Herds of crossbred miniature cattle tested chondro free, can lack uniformity and still have both “long legged” and “short legged” cattle. Some untested “short-legged” cattle (that look like chondro carriers), may not have chondro. They may just be genetically short. However, short legged miniature cattle that look chondro positive, usually are. To avoid birth defects, only DNA testing can tell breeders for sure. Photo above left: A naturally short little red Dexter cow, Legend Red Mona, ADCA No. 15552, who measured 40" hip height at 5 years of age. She tested non-carrier for chondro. Photo courtesy of Barbara Netti, Legend Rock Ranch, Texas, 2015. Registries and Breeding. Most breed associations do not require testing for dwarfism. Whether or not a miniature composite or breed or herd has carrier cattle within its population, is the responsibility of individual breeders, sellers and buyers to test for and manage with honest and ethical practices. Do All Miniature Cattle need DNA testing for BD? No, not if they have no Dexter in their pedigree. Otherwise, that depends upon how reliable their pedigree is, if known. A lot of today's miniature cattle breeds are composites (crossbred cattle of known breeding) or percentage cattle that were originally developed using short-legged Dexter cattle. A general rule of thumb is, if a miniature cow or bull has, or could have a Dexter ancestor, and is unknown status, it should be tested for BD before being bred to another unknown status animal. Testing. Calves can be DNA tested by sending in 30-50 pulled hairs (including the roots) from their tail switch, to a testing lab. The tail switch hairs have the largest root bulbs and in calves, are the easiest to extract DNA from in the lab. You can pull hair from anywhere on cattle, but make sure the root bulbs of the hair are included, and they should be easily seen with the naked eye. Use a pair of pliers, a box of fresh clean plastic sealable (storage) bags, and a flashlight if needed. Be very careful not to contaminate one animal's sample with another animal's hair. As you pull and the cow pulls away, you should get a good sample, and perhaps an annoyed cow but not an upset cow. Hair samples cost less but blood or tissue samples can also be used for DNA testing in most labs. DNA TESTING: The first test for chondrodysplasia became available in 2003 (with the 1st testing license given to SRC Lab in Canada). In 2006 Texas A&M got licensed to test for chondro, then UC-Davis VGL, and in time a few more. Here is a link to VGL's Biotechnology page that stays current with all DNA tests when they become available, and keeps links to all the labs available when they get licensed to perform them. Some breed registries cooperate with certain labs and offer special member discount prices for tests or panels of tests that meet the needs of their breed. For beginners just starting out with miniature cattle, deciding whether or not to buy or breed carrier cattle is the first decision they might make. When deciding on a breed, learn the differences between crossbred, composite, purebred and fullblood cattle, remembering that BD1 is only found in Dexter DNA. Visit and talk with as many breeders as you can. Visit cattle herds in person. If present, look at carrier and non-carrier miniature cattle of all breeds, and at all ages. You will figure out what will work best for you. 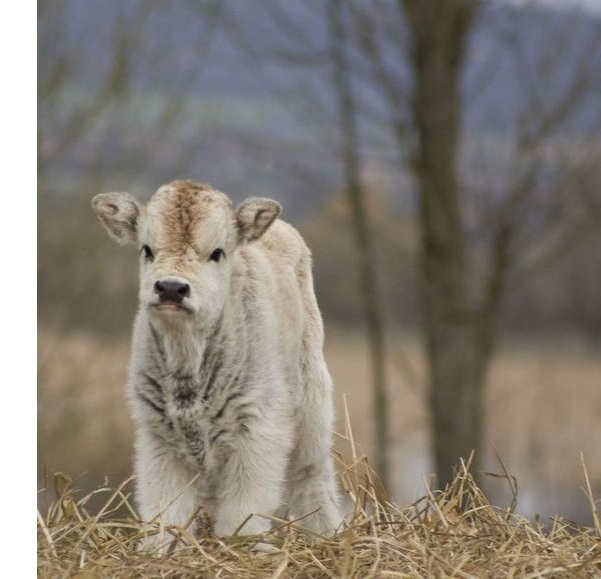 *In October of 2018, a new BD variant was found in a family of Miniature Zebu in Germany. It is a lethal recessive. 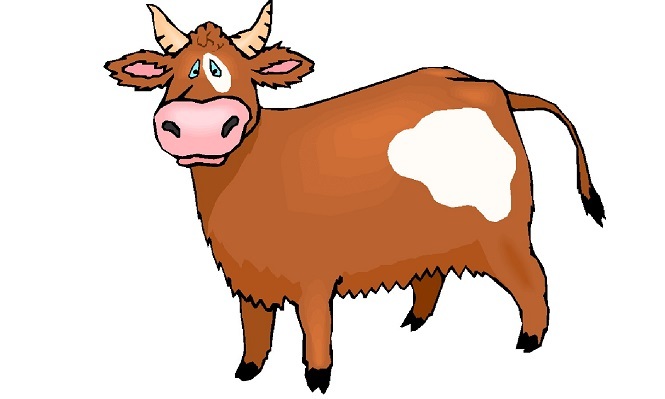 PHA occurs in several breeds of cattle. Research by Dr. Jon Beever at the University of Illinois identified the mutations responsible for PHA in cattle. He discovered that there are 2 mutations that cause PHA. The affected gene is the same gene for the different breeds, but the specific mutation associated with PHA·D in Dexter cattle is different from the PHA mutation in Maine-Anjou/Shorthorn. PHA testing became available in the United States in 2009. Primary breed(s) Genetic dwarf mutation Mode of inheritance heterozygous homozygous DNA testable? DNA Companies. A current list of DNA tests available for cattle genetic conditions, and list of the labs that offer them. PHA·D, like BD1, is found exclusively in Dexter cattle. PHA is characterized by incomplete development of the lungs and severe subcutaneous fluid accumulation. The "WaterBaby" aborted calf is (in some ways) similar to a "BullDog" aborted calf. PHA is a recessive gene. A heterozygous PHA(+) calf is a normal calf, with no visual indications of carrying. PHA is not dwarfism and has nothing to do with frame size. A PHA "WaterBaby" calf usually results in calving difficulty, while a BD BullDog calf usually doesn't. No one wants PHA in their cattle: With testing PHA·D will be avoided, and can eventually be exterminated. Hopefully, it is getting close to being exterminated now. All untested Miniature Cattle that are Dexters or could be Dexter composites should be tested for BD1 and PHA·D before being bred, to eliminate the 25% chance of either Bulldog or WaterBaby birth defects. PHA waterbaby calf associated dystocia can lead to death of the cow. A genetic test specific for the Dexter PHA mutation (PHA·D) is available from the UC Davis Vet Genetics Lab (VGL). The VGL PHA test does not detect the Maine Anjou /Shorthorn mutation. Those breeds can be tested for the non-Dexter PHA through their breed associations, such as the Maine Anjou, Shorthorn, and Simmental registries. Animal Biotechnology > DNA Companies. A comprehensive list of DNA tests available for cattle, and list of all the labs that currently offer these tests. Dwarfism How to Identify it and why it needs to be kept out of your herd. Information Assembled By: Eric J. Redeker, The Vertically Challenged Cattle Company, Miniature Texas Longhorns. The 5 ‘W’s” of PHA, DexterCattle.ca. PHA article on Thomas' Dexter's website. British and Continental Cattle Breeds. Homestead on the Range, November 28, 2017. From Big to Small to Big to Small: By Harlan Ritchie, a 3-part Pictorial History of Cattle Changes Over the Years. It is fascinating to look at the photos of prize-winning champion cattle over the years. You can see when dwarfism was discovered and recognized as a fault; and the sudden and drastic reversal to overly tall and lanky cattle, and imports of exotic or continental breeds became the rage. It is fairly accepted as fact that Angus for example, was infused with Holstein and Chianina, during the fast change in type, the pure Shorthorn cattle were deluged with Maine Anjou, Herefords were infused with Simmental... IOW, probably some trends happened "too quickly" in history, which was an indication that crossbreeding was done, and registered as "pure." Studying mutations and watching how they spread over the generations and into other breeds also provides evidence of breed tampering in some cases. “A recessive lethal chondrodysplasia in a miniature zebu family results from an insertion affecting the chondroitin sulfat domain of aggrecan” Struck, Ann-Kathrin et al.BMC genetics vol. 19,1 91. 11 Oct. 2018, doi:10.1186/s12863-018-0678-8 "We found a novel mutation in ACAN causing a recessive lethal chondrodysplasia in Miniature Zebu cattle. A diagnostic test for this mutation is now available for Miniature Zebu breeders preventing further cases of bulldog syndrome by targeted matings. To the authors’ best knowledge, this is the first case of a Miniature Zebu associated with an ACAN mutation." NOTE: This newly discovered BD variant was found in one family of miniature Zebu, on one farm, in Germany. Rapid discovery of De novo deleterious mutations in cattle enhances the value of livestock as model species. Bourneuf E, Otz P, Pausch H, Jagannathan V, Michot P, Grohs C, Piton G, Ammermüller S, Deloche M-C, Fritz S. Sci Rep. 2017;7. Germline mutation within COL2A1 associated with lethal chondrodysplasia in a polled Holstein family. Reinartz S, Mohwinkel H, Sürie C, Hellige M, Feige K, Eikelberg D, Beineke A, Metzger J, Distl O. BMC Genomics. 2017;18(1):762. PRKG2 Gene Mutation for Dwarfism (D2) Fact Sheet. D2 was recognized as a specific strain of dwarfism on September 7, 2007. D2 is caused by a recessive mutation on a single cattle chromosome. Cattle that are homozygous for the mutated gene will exhibit D2. Revised 06/2016. Dwarfism in Angus cattle is caused by a mutation in the GMP dependent, type II protein kinase (PRKG2) gene. Lethal chondrodysplasia in a family of Holstein cattle is associated with a de novo splice site variant of COL2A1. Agerholm JS, Menzi F, McEvoy FJ, Jagannathan V, Drögemüller C. BMC Vet Res. 2016;12(1):100. Hydrops associated with chondrodysplasia of the fetus in a miniature Scottish Highland cow. Cabrera LC, McNabb BR, Woods SE, Cartoceti AN, Busch RC.J Am Vet Med Assoc. 2016;248(5):552–6. Dwarfism in Cattle. Irish Cattle Breeding Federation; ICBF.com. 2016. Dwarfism in Cattle, video by Karlee Logan published on 20 January 2015. 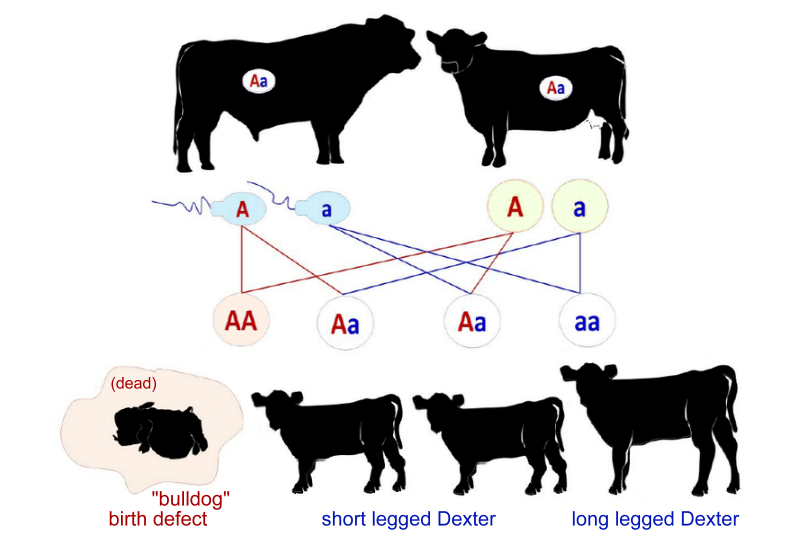 Bulldog dwarfism in Dexter cattle is caused by mutations in ACAN. Mammalian Genome:Authors: Julie A. L. Cavanagh, Imke Tammen, Peter A. Windsor, John F. Bateman, Ravi Savarirayan, Frank W. Nicholas, Herman W. Raadsma, Springer Science+ Business Media. N.p., 28 June 2007, November 2007, Volume 18, Issue 11, pp 808–814. Web. 27 May, 2014, updated and re-published. Chondrodysplasia. Davidson, Carole, N.p., 2008. Web. 29 May 2014, American Dexter Cattle Association, DexterCattle.org. 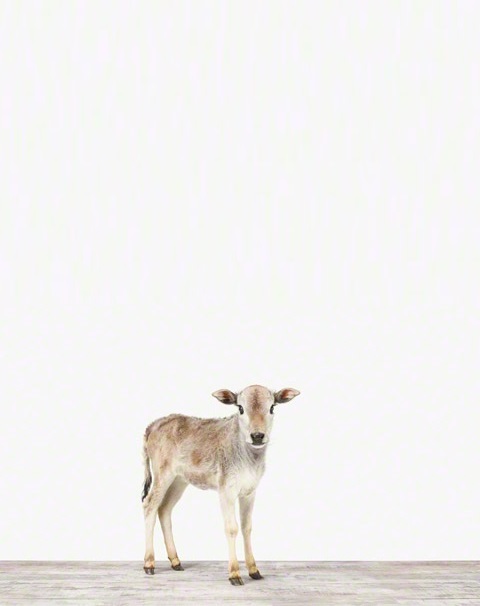 Dwarfism in Cattle, By Dottie Love, Fancher Love Ranch, 2014. Genetic and PathoAnatomical Features of the Bovine Prenatal Lethal Chondrodysplasia Hereditary Genetics ISSN:2161-1041, Genetics an open access journal, Volume 3 • Issue 4 • 1000132. Moura et al., Hereditary Genetics 2014, 3:4. This is an open-access article distributed under the terms of the Creative Commons Attribution License, which permits unrestricted use, distribution, and reproduction in any medium, provided the original author and source are credited. http://dx.doi.org/10.4172/2161-1041.1000132. Corresponding author: Dr. Enio Moura, Service of Medical Genetics, Faculty of Veterinary Medicine, Pontifícia Universidade Catolica do Paraná (PUCPR), Curitiba, Parana, Brazil, Tel: 55 41 3274-4501; E-mail: enio.moura@pucpr.br Rec date: Apr 15, 2014. Copyright: ©2014 Moura E, et al., Pub date: Aug 25, 2014. Figure 1: bulldog calf Figure 2: Risk of prenatal lethal chondrodysplasia in a mating of short-legged Dexters. Current Research Genetic and PathoAnatomical Features of the Bovine Prenatal Lethal Chondrodysplasia provides an overview of the current state of knowledge regarding the genetics and anatomical pathology of bovine prenatal lethal chondrodysplasia, describing the characteristic phenotype of affected animals and the Mendelian aspect of genetic inheritance. It also is the first record of a spontaneous occurrence of another chondrodysplasia mutation in the Nelore (right), breed of Brazil. Figure 1 ABOVE LEFT: shows several of the abnormalities in an affected Nellore calf with a gestational age of approximately eight months. This is another BD mutation, but the bulldog calf defect is the same. Figure 2 ABOVE RIGHT: [BD1] ...in the Dexter is caused by incompletely dominant mutations in the aggrecan gene (ACAN gene). If we represent the ACAN gene as “a” and the mutant allele as “A”, the long-legged Dexter has an “aa” genotype (homozygote), the short-legged Dexter has an “Aa” genotype (heterozygote), and the bulldog Dexter has an “AA” genotype (homozygote). Thus, the homozygosity of the “A” allele causes a defect in the endochondral ossification that is so severe that it is incompatible with life. Therefore, based on the principle of Mendelian genetics, if two heterozygote Dexters are crossed, there is a 25% chance of the offspring having long legs, a 50% chance that it will have short legs, and a 25% chance that it will be affected by BPLC (a bulldog calf), as illustrated in Figure 2. The inheritance pattern that we have described is classically known as incomplete dominance (semidominance). 2014. Genetic and Pathoanatomical features of the bovine prenatal lethal chondrodysplasia. Moura E, Prado A, Pimpão C, Murakami C, Ribeiro D. Hereditary Genet. 2014;3(132):2161–1041.1000132. “The Truth: Every Living Thing is a Genetic Defect Carrier,” Decker, Jared E., University of Missouri assistant professor and beef genetics specialist. N.p. Web. 06 June 2014. Breeding Matters – Inbreeding vs. Line Breeding, By Morgan Hartman / October 20, 2014. Deletion in the EVC2 Gene Causes Chondrodysplastic Dwarfism in Grey Alpine cattle or Tyrolean Grey Cattle, (Australian Brown Swiss breed) Published: July 11, 2014, Murgiano L, Jagannathan V, Benazzi C, Bolcato M, Brunetti B, Muscatello LV, et al. (2014) and, Deletion in the EVC2 Gene Causes Chondrodysplastic Dwarfism in Tyrolean Grey Cattle. PLoS ONE 9(4): e94861, Editor: Claire Wade, University of Sydney, Australia. Chondrodysplasia, by Robyn Snelgar, BD2 New Zealand Dexter mutation; dextercattle.nz. Birth of a Bulldog Dwarf fetus on a farm in South Africa -Interesting- photos. ‘‘Snorter’’ Dwarfism in Herefords. Jones JM, Jolly RD. Dwarfism in Hereford cattle: a genetic morphological and biochemical study. NZ Vet J. 1982; 30:185–189. Reported and updated online Aug 22 2013. ‘‘Long-Nosed’’ Dolichocephalic Dwarfism in the Angus breed. (left) Koltes JE, Mishra BP, Kumar D, et al. A nonsense mutation in cGMP-dependent type II protein kinase (PRKG2) causes dwarfism in American Angus cattle. Proc Natl Acad Sci U S A. 2009; 106:19250–19255. Morphology and physiology of the epiphyseal growth plate. Burdan F, Szumilo J, Korobowicz A. Folia Histochem Cytobiol. 2009;47(1):5–16., and, Mackie EJ1, Ahmed YA, Tatarczuch L.
A miniature condition in Brahman cattle is associated with a single nucleotide mutation within the growth hormone gene: Article in Domestic Animal Endocrinology 37(2):104-11 · June 2009. Hormonal disruptions are evident in Brooksville miniature Brahman cattle caused by mutations in GH1 and GHR. Miniature Brahman cattle at the USDA ARS Subtropical Agriculture Research Station in Brooksville, FL have normal proportioned growth but are approximately 70% of mature height and weight when compared with Brahman cattle in the same herd. Pedigree analyses suggest that the condition is inherited through a recessive allele. Endochondral ossification: how cartilage is converted into bone in the developing skeleton. Int J Biochem Cell Biol. 2008;40(1):46–62. "The mammalian growth plate, also known as the physis, is a highly specialized mesoderm-derived cartilaginous structure. Each growth plate is a sandwich-like, multilayer structure divided into 4 functional zones: reserve, proliferative, hypertrophic, and calcified." ISU researcher leads effort, develops test to identify dwarfism gene 05-07-2008. Iowa State University, James Reecy, Animal Science. Bones and joints. Thompson, K. In: Jubb, Kennedy, and Palmer’s Pathology of domestic animals. 5th ed. Philadelphia, PA: Elsevier Saunders; 2007:13–33. "Several types of inherited chondrodysplasia occur in cattle, including “bulldog” chondrodysplasia, Telemark, brachycephalic, dolichocephalic, and rhizomelic types. Japanese Brown cattle with chondrodysplasia present with the rhizomelic type, with lesions confined to the long bones of the limbs, with prominent shortening of the forelimbs." Bulldog dwarfism in Dexter cattle is caused by mutations in ACAN. Cavanagh JA, Tammen I, Windsor PA, Bateman JF, Savarirayan R, Nicholas FW, Raadsma HW. Mamm Genome. 2007;18(11):808–14. Abstract: Bulldog dwarfsm in Dexter cattle is one of the earliest single-locus disorders described in animals. 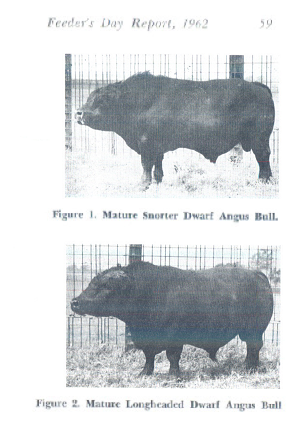 This form of dwarfism (known as bulldog dwarfism) was clearly documented in Dexter cattle in the 19th century (Curran 1990), and its Mendelian inheritance was suspected and discussed as early as 1904 (Seligmann 1904). Affected fetuses display extreme disproportionate dwarfism, reflecting abnormal cartilage development (chondrodysplasia). Typically, they die around the seventh month of gestation, precipitating a natural abortion. Heterozygotes show a milder form of dwarfism, most noticeably having shorter legs. Familial chondrodysplasia in Holstein calves. Agerholm JS, Arnbjerg J, Andersen O.J.. Veterinary Diagnostics Investigations. 2004;16(4):293–8. Congenital chondrodysplastic dwarfism with dyshematopoiesis in a Holstein calf. Naito K, Maruyama M, Dobashi K, Tanimura N, Kimura K, Haritani M, Nakajima Y. J Vet Med Sci. 2002;64(10):937–9. Chondrodysplasia in Australian Dexter cattle. Harper P, Latter M, Nicholas F, Cook R, Gill P. Aust Vet J. 1998;76(3):199–202. 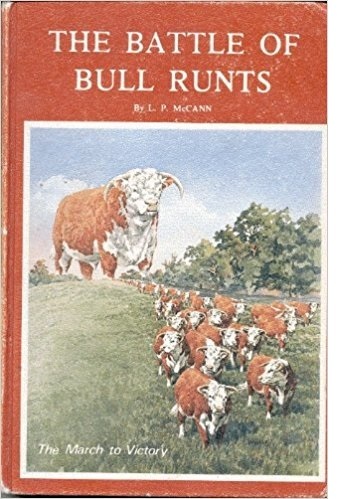 The Battle of the Bull Runts (Overcoming Dwarfism) ; by L.P. McCann, 1974. Congenital and Hereditable Defects Which Interfere With The Reproductive Efficiency Of Domestic Cattle (Bos tarus) (pdf) Mylon E . Filkins, Iowa State University, 1965. The inheritance of Two Different Types of Dwarfism in Beef Cattle, E.J. Turman, B.J. Watkins, Doyle Chambers and Dwight Stephens. Oklahoma Agricultural Experiment Station, Feeder's Day Report, 1962. 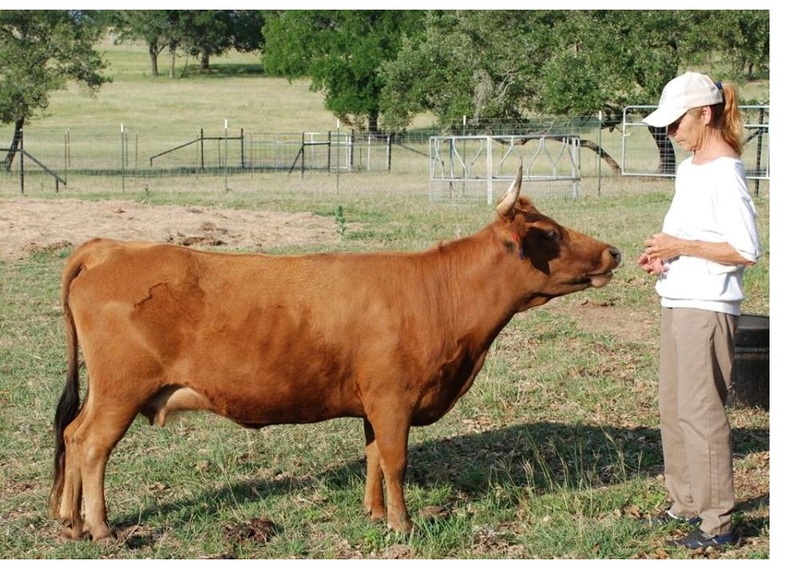 The inheritance of 2 different types of dwarfism in beef cattle, the snorter and longheaded types, were studied from the 1955-1961 breeding records of the Project 873 cow herd at Fort Reno. The data indicate that each is a simple autosomal recessive gene. The same gene produces the snorter dwarf in both the Hereford and the Angus breeds. The longheaded dwarf gene is a different gene from the snorter gene. 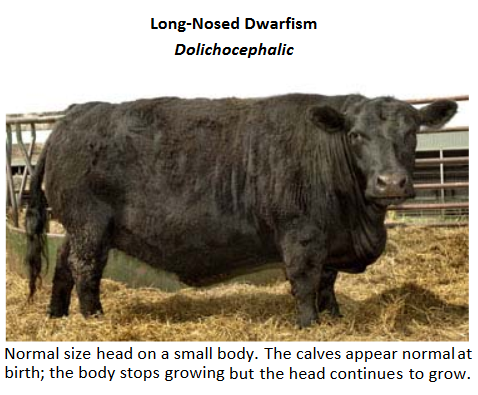 Longhead Dwarfism: found only in Angus cattle. It was not an allele to snorter dwarfism. It may be missed in cattle, since it is realtively harmless, other than a characteristic abnormality in the lumbar vertebrae (identified by xrays) and short legs, and sometimes with larger than normal heads for their body size. It sounds like it is still around, since it is not a real obvious type of dwarfism and is likely not always recognized. Dwarfism In Beef Cattle, E W. Stringam Complete Printable Article (554K) Canadian Journal of Comparative Medicine and Veterinary Science. 1958 Nov; 22(11): 400–403. Bulldog calf in African cattle. Carmichael J. Nature. 1933;131:878. 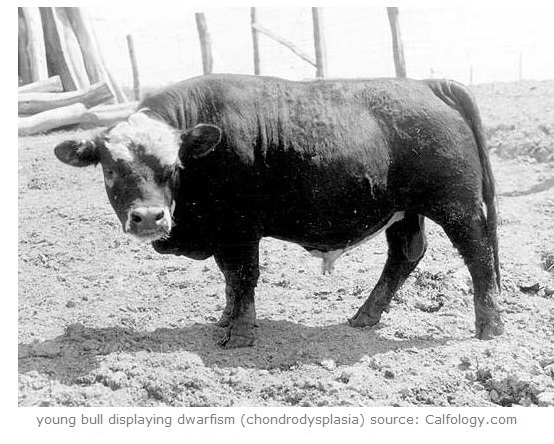 The bull-dog calf: a contribution to the study of achondroplasia. Crew F: SAGE publications; 1924. Cretinism in calves. Seligmann C.J Pathol. 1904;9(3):311–22. Declaration of Conflicting Interests: The author declares no potential conflicts of interest with respect to the research, authorship, and/or publication of this article. Funding: The author received no financial support for the research, authorship, and/or publication of this article. This Chondrodysplasia Report includes the combined hard work and results of many dedicated researchers and miniature cattle breeders over the years. Much of the information contained in this report was generously contributed by, Carol Davidson (BC, Canada; foremost authority on Dexter cattle in North America), Dorothy Love (TX miniature Zebu breeder), Barbara Netti (TX Dexter breeder), Patti Adams (KS Dexter breeder), Hans Peterson (MI Dexter and mini Scottish Highland breeder), Linda McKay (OK miniature Longhorn cattle) and Kirk Fackrell (WA Dexter and fullblood classic and miniature Belted Galloway breeder). This collection of information is written, compiled and edited by Donna G Vickery. As author I am solely responsible for the content in this article. My sources are not responsible for my findings in this report (since my experience is with genetics and breeding mostly standard breed cattle--I have only owned 2 miniature cows). My sources are not to be held responsible or blamed for any opinions or research conclusions I have come up with. My sources are not necessarily in agreement with some or any of my content, nor each other's findings. But that's OK! What matters is informing ourselves, being truthful and educating each other. And enjoying our cattle! Donna Grace Vickery, March 2018. » Related Article: “Genetics of Coat Color in Cattle, a brief review of what is currently known about the genes controlling cattle coat colors and patterns.” By Sheila M. Schmutz, Ph.D., Professor Department of Animal Science College of Agriculture and Bioresources University of Saskatchewan Saskatoon, Canada. This is a major source of information on the internet about bovine coat color. » Related Article: “White Park Colour Pattern” Research paper presented to the White Galloway conference in Germany in 2014. » Related Article: “Cattle Colour Genetics” A blog studying spotting and hereford marking genetics, by a rancher in Saskatchewan. » Related Article: “Genetics of Highland Coat Color. In this article I will attempt to explain what is known about the genetics behind coat colour in Highlands and some thoughts we have on what is as yet unproven.” By Glen Hastie, Bairnsley Scottish Highland Cattle, Victoria, Australia. This article also references most major sources of information about cattle color genetics on the internet. » Related Resource: Bovine Genome.org The Bovine Genome Database project is to support the efforts of bovine genomics researchers by providing data mining, genome navigation and annotation tools for the bovine reference genome. Based on the Hereford cow, L1 Dominette 01449. We are not responsible for misrepresentation & do not represent any guarantees.